Manchester United have been given a warning of sorts involving replacing Jose Mourinho with former Real Madrid manager Zinedine Zidane. Talk has been hotting up that the French tactician could be on his way to Old Trafford, with CaughtOffside being told he’s confident he could be offered the job soon and that he’s even been in contact with Paul Pogba and Anthony Martial about it. United haven’t made the best of starts to the season under Mourinho, who looks like repeating what happened to him at his third season at Chelsea recently. Things fell apart quickly at Stamford Bridge after a similarly poor run of results early in the season, but Brazilian legend Ronaldo believes it would be unwise to write him off. The Portuguese has an exceptional record throughout his career, and Ronaldo gave this response when asked about the prospect of Zidane coming in in his place. ‘I don’t know what’s happening in Manchester, but wait before criticising Mourinho. He’s special and he’s won a lot,’ he said. 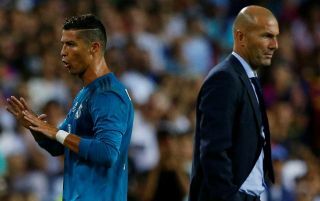 Ronaldo clearly seems to think there’s a risk associated with ditching such an experienced manager with one less experienced, even if Zidane had an extraordinary record in less than three years in management. The 46-year-old helped Real win three Champions League finals in a row, putting him up there with the most successful coaches of all time in the tournament. Still, he wouldn’t have players like Cristiano Ronaldo, Luka Modric and Sergio Ramos on his books at Old Trafford. Speaking of Ronaldo, his namesake added that he doesn’t necessarily believe the Portuguese forward’s arrival at Juventus automatically makes them favourites for this season’s Champions League. ‘Juventus are a really strong side,’ said the 41-year-old.